The goal of the talk is to introduce the main modelling features of periodic media in elasticity (i.e. governing equations and Floquet-Bloch continuity conditions at the boundary of the unit cell) that are usually employed to investigate two types of phenomena: instability of periodic composites and propagation of elastic waves in micro-architected materials. The general approach will be specialised to the case of unit cells generated according to the quasicrystalline substitution rule. 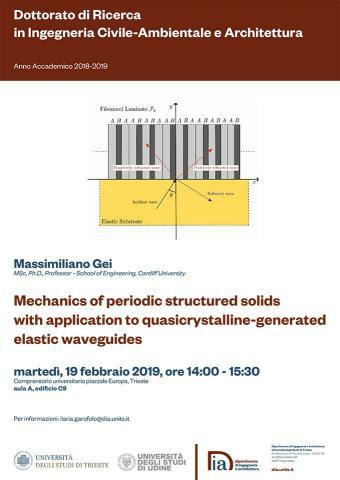 Examples of application of the theory will be shown for (i) golden-mean quasicrystalline axial and flexural waveguides and (ii) Fibonacci elastic laminates, for which negative refraction of antiplane waves can be predicted. The study of periodic media in mechanics is the fundamental building block to conceive a large class of meta-materials and meta-structures which are currently investigated in mechanical, aerospace and civil engineering.